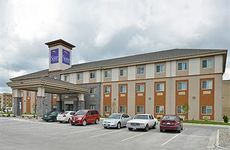 Find Sleep Inn & Suites deals, discounts and special offers. This hotel offers an indoor pool, sauna & hot tub and complimentary shuttle service to the airport, bus and train depot. Nearby attractions include Red River Valley Fairgrounds, Thunder Road Family Fun Park and the Red River Zoo. This non smoking hotel is conveniently located downtown, near the Plains Art Museum, and the Heritage Hjemkomst Center. Located next to West Acres Mall, the hotel is convenient to Fargodome, Bonanzaville and the Red River Zoo. Aimed at the business traveler, this non smoking hotel provides a free shuttle service to the airport. Designed for hosting events, the hotel features an indoor pool complex and it is close to West Acres Shopping Center. The hotel is conveniently located to the West Acres Shopping Center, the Fargodome, and numerous corporate offices.